Are you an artist and want to make money from your music (online)? Do you have a hobby and want to sell your products/services via your own webshop? Are you interested in starting your own business or project? Do you want to make an extra income? Doing things that you already like to do? Do you want to contribute more to your community? Visit this live workshop training for female ‘wantrepreneurs’, artists and hobbyist just like yourself! Scroll below to sign up! 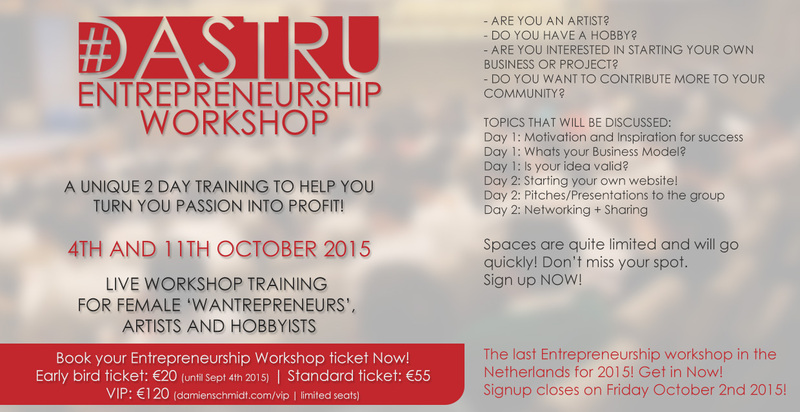 This will be the last Entrepreneurship workshop in the Netherlands for the rest of the year! Get in Now! Signup closes on Friday October 2nd 2015 at 10pm! Location: Robijnhorst 197, Den Haag. Or even if you’re just generally interested in entrepreneurship, or those who just want to do something ‘more’! The workshop is designed to bring structure to what you currently have, help you see new opportunities and leave you with an extra boost of motivation. Key activities you have to do. Day 1: Whats your Business Model? Day 1: Is your idea valid? Day 2: Starting your own website! Spaces are quite limited and will go quickly! Don’t miss your spot. Fill in the form below and secure your spot! Again, Sign up NOW! DO YOU WANT MORE? Sign up for the VIP Package! Warning: You definitely will have a great time and will enjoy all the insights that you receive. And you will want to tell others to signup for the next time around! PS: Yes, guys are also welcomed.